In the summer of 1933, shortly after Roosevelt's "First 100 Days," America's richest businessmen were in a panic. It was clear that Roosevelt intended to conduct a massive redistribution of wealth from the rich to the poor. Roosevelt had to be stopped at all costs. Irenee Du Pont - Right-wing chemical industrialist and founder of the American Liberty League, the organization assigned to execute the plot. Grayson Murphy - Director of Goodyear, Bethlehem Steel and a group of J.P. Morgan banks. William Doyle - Former state commander of the American Legion and a central plotter of the coup. John Davis - Former Democratic presidential candidate and a senior attorney for J.P. Morgan. Al Smith - Roosevelt's bitter political foe from New York. Smith was a former governor of New York and a codirector of the American Liberty League. John J. Raskob - A high-ranking Du Pont officer and a former chairman of the Democratic Party. In later decades, Raskob would become a "Knight of Malta," a Roman Catholic Religious Order with a high percentage of CIA spies, including CIA Directors William Casey, William Colby and John McCone. Robert Clark - One of Wall Street's richest bankers and stockbrokers. Gerald MacGuire - Bond salesman for Clark, and a former commander of the Connecticut American Legion. MacGuire was the key recruiter to General Butler. The proven record of Prescott Bush's involvement in financing the German war machine (WWII) dovetails with the fact that he was part of a criminal cabal that actively sought to impose a fascist coup in America. Prescott did not succeed but many would argue that two generations down the line the mission has all but been accomplished. 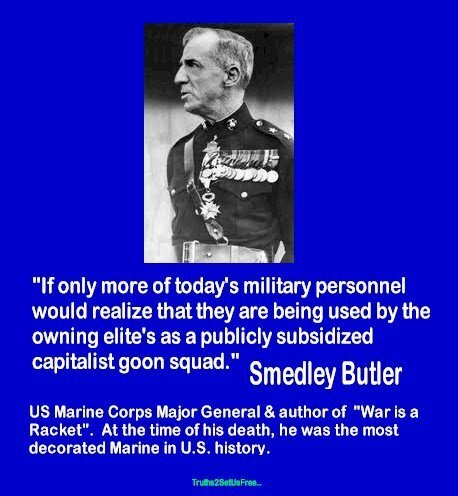 The plotters attempted to recruit General Smedley Butler to lead the coup. They selected him because he was a war hero who was popular with the troops. The plotters felt his good reputation was important to make the troops feel confident that they were doing the right thing by overthrowing a democratically elected president. However, this was a mistake: Butler was popular with the troops because he identified with them. That is, he was a man of the people, not the elite. When the plotters approached General Butler with their proposal to lead the coup, he pretended to go along with the plan at first, secretly deciding to betray it to Congress at the right moment. "You know the American people will swallow that. We have got the newspapers. We will start a campaign that the President's health is failing. Everyone can tell that by looking at him, and the dumb American people will fall for it in a second…"
The businessmen also promised that money was no object: Clark told Butler that he would spend half his $60 million fortune to save the other half. "We need a fascist government in this country… to save the nation from the communists who want to tear it down and wreck all that we have built in America. 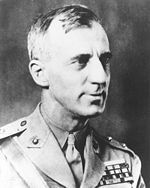 The only men who have the patriotism to do it are the soldiers, and Smedley Butler is the ideal leader. He could organize a million men overnight." Indeed, it turns out that MacGuire travelled to Italy to study Mussolini's fascist state, and came away mightily impressed. He wrote glowing reports back to his boss, Robert Clark, suggesting that they implement the same thing. If this sounds too fantastic to believe, we should remember that by 1933, the crimes of fascism were still mostly in the future, and its dangers were largely unknown, even to its supporters. But in the early days, many businessmen openly admired Mussolini because he had used a strong hand to deal with labor unions, put out social unrest, and get the economy working again, if only at the point of a gun. Americans today would be appalled to learn of the many famous millionaires back then who initially admired Hitler and Mussolini: Henry Ford, John D. Rockefeller, John and Allen Dulles (who, besides being millionaires, would later become Eisenhower's Secretary of State and CIA Director, respectively), and, of course, everyone on the above list. They disavowed Hitler and Mussolini only after their atrocities grew to indefensible levels. The plot fell apart when Butler went public. The general revealed the details of the coup before the McCormack-Dickstein Committee, which would later become the notorious House Un-American Activities Committee. (In the 50s, this committee would destroy the lives of hundreds of innocent Americans with its communist witch hunts.) The Committee heard the testimony of Butler and French, but failed to call in any of the coup plotters for questioning, other than MacGuire. In fact, the Committee whitewashed the public version of its final report, deleting the names of powerful businessmen whose reputations they sought to protect. The most likely reason for this response is that Wall Street had undue influence in Congress also. Even more alarming, the elite-controlled media failed to pick up on the story, and even today the incident remains little known. The elite managed to spin the story as nothing more than the rumors and hearsay of Butler and French, even though Butler was a Quaker of unimpeachable honesty and integrity. Butler, appalled by the cover-up, went on national radio to denounce it, but with little success. MacGuire denied [Butler's] allegations under oath, but your committee was able to verify all the pertinent statements made to General Butler, with the exception of the direct statement suggesting the creation of the organization. This, however, was corroborated in the correspondence of MacGuire with his principle, Robert Sterling Clark, of New York City, while MacGuire was abroad studying the various form of veterans' organizations of Fascist character. Needless to say, the survival of America's democracy is not an automatic or sure thing. Americans need to remain vigilant against all enemies... both foreign and domestic.